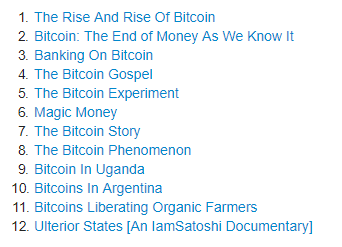 I found a great resource online for those who are looking for a film to watch on the subject of Bitcoin. There are actually many feature films and documentaries you can watch to get up to speed on the history of benefits of this new type of money. If you know of any more great documentaries feel free to post them here, and share with all of us. There is no such Official list. This is a public warning: stop spamming with hidden links to “smartbitcoininvestments” or you’ll be banned and all your spam links will be gone. If you want to be useful to the community here, provide some relevance to Bitcoin Gold - and stop treating us as as your link farm.